Educated at Ealing and Trinity College, Oxford. Chosen a fellow of Oriel College. Ordained an Anglican priest in 1824. Curate of Saint Clement's, Oxford for two years. As he continued his studies he began to be influenced by Catholic writers. Vicar of Saint Mary's in 1828. Resigned his position in 1832. Helped found and guide the Tractarian Movement beginning in 1833. His writings grew more and more in sympathy with Catholicism, and he was forced to resign his position at Saint Mary's. He claimed that his philosophy was a via media (middle way) between Catholicism and Luthero-Calvinism, but he came to see that this idea was just a repetition of old heresies. In 1841 he lived in seclusion with friends at Littlemore, reading, studying, and praying. In 1845 he joined the Catholic Church. Ordained in Rome, Italy in 1846. Joined the Oratorians. Returned to England in 1847 where he lived in Maryvale, Cheadle, Saint Ann's, Birminghan, and finally Edgbaston where he lived the bulk of his remaining 40 years. Founded the London Oratory. Influential writer on matters of theology, philosophy, and apologetics bringing hundreds into the Church; noted poet. Made an honorary fellow of Trinity College in 1878. Created cardinal in 1879 by Pope Leo XIII. God knows me and calls me by my name. I have my mission-I never may know it in this life, but I shall be told it in the next. I am a link in a chain, a bond of connexion between persons. if I do but keep His commandments and serve Him in my calling. - still He knows what He is about. Mother of one son, John, who became bishop of Antioch. Widow. Formed a group of local Christian women into an informal community. When Julian the Apostate came through the area in 362, he stopped to hear the community singing Psalms during their prayers. He took part of their translation to be a direct insult to him, and had Publia smacked around by his men. He planned to have the entire community executed for the perceived slight, but was killed in battle with Persia soon after, leaving Publia and her sisters to live and worship in peace. Missionary to Paris, France. First Bishop of Paris. His success roused the ire of local pagans, and he was imprisoned by Roman governor. Martyred in the persecutions of Valerius with Saint Rusticus and Saint Eleutherius. Legends have grown up around his torture and death, including one that has his body carrying his severed head some distance from his execution site. Saint Genevieve built a basilica over his grave. His feast was added to the Roman Calendar in 1568 by Pope Saint Pius V, though it had been celebrated since 800. One of the Fourteen Holy Helpers. Worked as a pharmacist's apprentice while studying for the priesthood. After ordination on 22 December 1572, he worked with prisoners and the sick. His example attracted some young laymen to assist him, most of whom became priests themselves. 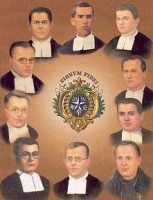 This group formed Clerks Regular of the Mother of God of Lucca, a congregation of diocesan priests which, for reasons having to do with the politics of the Reformation and an unfounded accusation that John wanted to form the group for his own personal aggrandizement, provoked great opposition. The Clerks were confirmed on 13 October 1595 by Pope Clement VIII, but John was exiled from Lucca for most of the rest of his life. 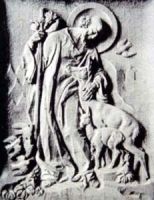 John was assisted in his exile by Saint Philip Neri, who gave him his quarters - and his pet cat! In 1579 he formed the Confraternity of Christian Doctrine, and published a compendium of Christian doctrine that remained in use until the 19th century. He died from a disease caught while tending plague victims. By the deliberate policy of the founder, the Clerks have never had more than 15 churches, and today form only a very small congregation. The arms of the order are azure, Our Lady Assumed into Heaven; and its badge and seal the monogram of the Mother of God in Greek characters. Relative of Saint Vincent Ferrer. Deeply religious from childhood, Louis joined the Dominicans in 1544 at age 18. Ordained in 1547 at age 21. Noted preacher. Master of novices for 30 years. Worked with plague victims in 1557. Friend of Saint Teresa of Avila, and helped her reform her order. 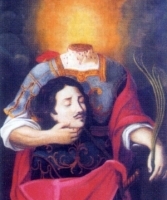 Missionary to Central and South America, and to the Caribbean; Louis expected to be martyred. He survived a poisoning attacks by local shamans, and reported to have converted 15,000. Prophet, miracle worker, and may have had the gift of tongues. After seven years of work, Louis returned to Spain to report on the bad actions of Spaniards in the region; he was re-assigned to preaching and training novices in Valencia. 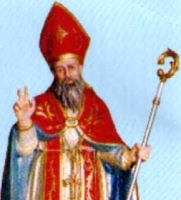 Late 6th-century layman hermit who assisted Church authorities, including Saint Florido and Saint Amanzio, re-bulid Città di Castello, Italy and revitalize the faith there following the Greek-Gothic war. Following the death of Saint Amanzio, Donnino retired to spend the rest of his days as a hermit near Rubbiano. He later moved to a hermitage in modern Villa San Donino to be closer to Città di Castello. Old Testament patriarch. Married to Sarah. Founder of the Hebrew nation. Father of all believers in the true God. At God's command he moved from his native Chaldea to Canaan. Nomadic shepherd. Reported to have lived to age 175. Soldier. Personal attendant to Roman emperor Maximian Herculeus in Milan, Italy. Convert. When the anti-Christian persecutions began, Domninus fled, was captured, and immediately executed. Martyr. Cousin of Saint Stephen of Hungary. After a worldly youth, he was brought to the faith by Saint Godehard of Hildesheim. Benedictine monk at Niederaltaich, Bavaria, Germany. Falling back on his old ways, he actually campaigned to be abbot of Gollingen, and won the position; he was a complete failure in the position. Learning from the experience, he resigned the position and lived his last 28 years as a hermit in the mountains of Sumava, modern Czech Republic. Benedictine monk in the abbey of Monte Cassino, Italy. Abbot of Monte Cassino in 828. Noted for his generosity and almsgiving. Imprisoned by the Prince of Benevento, Italy, who tried to extort money from him but killed him in the process. Martyr. Ninth-century layman in Antioch, Syria. Married to Saint Athanasia of Antioch. Silversmith and possibly a banker. Father of two. On the death of their children, Andronicus and Athanasia agreed to live separately as hermits in upper Egypt. Made multiple pilgrimages to Jerusalem. Frankish hermit. Lived in a forest in Hainault, Belgium. 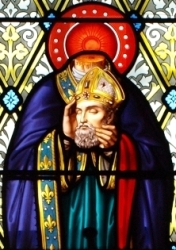 His reputation for holiness attracted many disciples for whom he built and governed an abbey, now known as Saint-Ghislain, near Mons, Belgium. 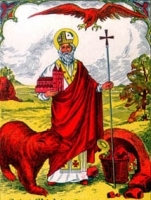 Spiritual teacher of Saint Waltrude, Saint Lambert, and Saint Valerius. Augustinian monk as a young man. Spiritual student of Blessed Gausberto of Montsalvy. Monk at Montsalvy abbey. Chosen abbot in 1079, he served for over 30 years. Ninth-century lay woman in Antioch, Syria. Married to Saint Andronicus of Antioch. Mother of two. On the death of their children, Andronicus and Athanasia agreed to live separately as hermits in upper Egypt. Made multiple pilgrimages to Jerusalem. 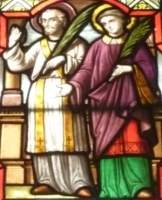 Priest and deacon who were tortured and martyred with Saint Denis. Patriarch of Alexandria, Egypt in 188; he served for 43 years. 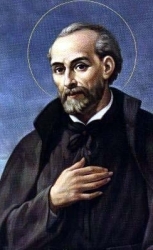 Supported the catechetical school of Alexandria, appointing Origen as director of the school in 203; he later exiled Origen for being ordained without permission. Educated in Poitiers, France. Benedictine monk at Liguge. Evangelist to the Lavedan in Pyrenees in France. Hermit. Monk at Cluny Abbey, France. Spiritual student of Saint Odilo of Cluny. First abbot of the Benedictine abbey at Tyniec, Poland. First archbishop of Cracow, Poland, ordained in 1046. Confessor of the faith, abused by Arian heretics for remaining loyal to orthodox Christianity. Studied in Paris, France. Taught theology in Douai, France. Benedictine monk at Anchin Abbey in 1113. Abbot at Anchin c.1130. Benedictine monk at Monte Cassino Abbey. Archbishop of Salerno, Italy. Assisted Pope Saint Gregory VII on his death-bed. Monk at Sanpaterniano de Fano, Narni, Umbria, Italy. Claimed by both the Basilians and Benedictines. Spiritual student of Saint Gislenus in Belgium and France. Three Christians martyred together in Laodicea, but no other information about them has survived but their names - Didymus, Diodorus and Diomedes.